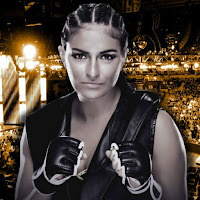 NXT Superstar Sonya Deville (Daria Berenato) recently spoke with Byron Saxton for the WWE website. She discusses her MMA training, how she's changed since coming to NXT and more. Congrats on your recent NXT victory on WWE Network. You've had a very interesting couple of years under the WWE/NXT umbrella. What's the difference between the Sonya Deville who first arrived and the Sonya Deville we see now? My first time being inside the Performance Center was for the WWE Tough Enough tryouts, and although I knew hardly anything about sports-entertainment, I knew I wanted to be a part of this place. All I knew was that I loved to fight, I loved to perform and I loved being inside the WWE Performance Center. Here we are almost two years later and my mindset is the same as day one: I love being here and I love fighting, and with NXT, I get to do that almost every single day of the week. My life is amazing. I get paid to hurt people. Do you feel pressure to succeed in this division considering some of the names that have come before you? The path that has been paved before me is impressive. I look up to and have learned a lot from the women before me. With that said, there has never been a woman in this ring with the experience that I have in fighting. Take my skill set, my strikes, my submissions. You can call WWE whatever you want, but at the end of the day, it's a fight and fighting is my specialty. What should the NXT Universe understand about you? I live for the pressure, I live for the moments when I'm deep in the match, out of breath, hurt and feel like throwing up. It's in those moments that I push through, I keep punching, I keep going forward, because no matter what, I will never stop. That challenge, that uncomfortable feeling is what fuels me, and honestly, it's what I live for. I'm not here for the games. I didn't come here to be anybody's little sidekick. I came here to fight and to take over. I'm changing the game. I don't expect anyone to know that yet, but you will.